Working in the Right of Way? 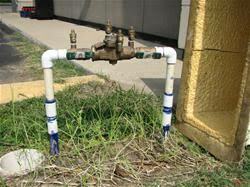 A backflow prevention device prevents water or other substances from flowing back into the public drinking water system through a cross connection. A cross connection is any temporary or permanent connection between the potable drinking water system and any source such as an irrigation system, a boiler, a commercial dishwasher, or any other device that may cause contamination of the public water system. The Cross Connection Program assists water suppliers and water users and certifies individuals that protect public water supplies from backflow hazards. These devices are mandated in the State of Oregon through Oregon Administrative Rules Chapter 333 Division 61. The City of Newport must submit an annual report certifying compliance with these rules. Although the City does not do device testing, we do maintain a database of devices, their test results, and compliance with annual testing requirements. If you have a backflow prevention device on your property, please do your part to ensure a safe drinking water supply for everyone. The law requires that owners of backflow devices test those devices annually and report those results to the City of Newport Backflow Prevention Specialist. Like fastening your seat belt or putting on a life jacket, backflow prevention is a safety measure against unforeseen accidents or events. Additional information can be found on the State of Oregon website, including a list of certified testers..